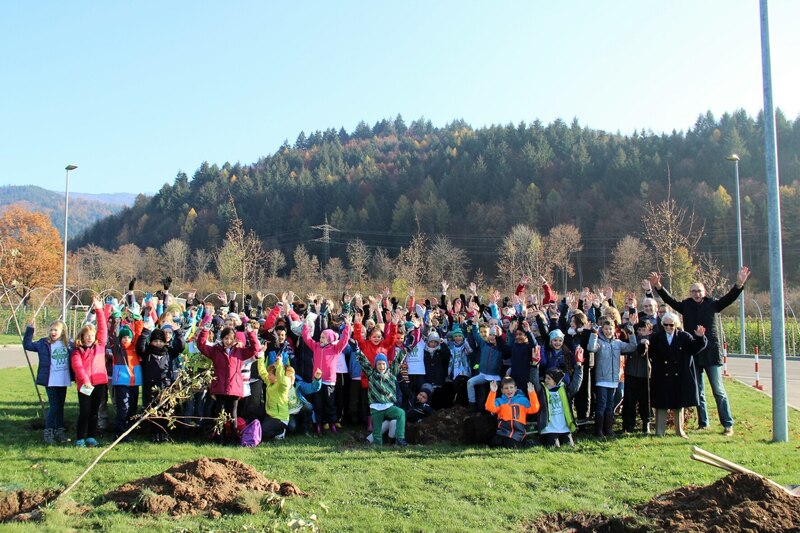 Waldkirch, November 2018 – Inspiring children and youths to get involved in climate protection was the mission for which the Plant-for-the-Planet pupils’ initiative invited young people to Waldkirch on 17 November 2018. About 90 children aged between 8 and 12 took part in the Action Day for Climate Protection at SICK AG and were trained to become ambassadors for climate justice. The young climate protection advocates were able to turn theory into practice at the Buchholz Distribution Center during a joint tree-planting campaign for climate neutrality. This is the second time that the Plant-for-the-Planet Academy has visited Waldkirch and called on young participants to grapple with the causes of, and potential solutions to, climate change. In addition to Gisela Sick and Renate Sick-Glaser (respectively widow and daughter of company founder Dr. Erwin Sick), Dorothea Sick-Thies was also among the guests – following her father’s tradition she has been involved in sustainability, environmental and climate protection for more than ten years and is committed to supporting the collaboration between SICK and Plant for the Planet. Dr. Robert Bauer (Chairman of the Executive Board of SICK AG) and Reinhard Bösl (Executive Board Member for Systems & Industries) believe that environmental protection and sustainable management have been firmly anchored in the corporate culture since the founding of the company: “The intelligent treatment of resources is not just a question of modern technologies. We therefore support education about the environment as early as possible to encourage children to take responsibility for their environment,” Reinhard Bösl said during the event. After some training in rhetoric, as well as presentations and workshops during which participants found out more about climate justice and developed joint activities for the future, the afternoon became more hands-on: completely committed, the young climate protectors planted more than 50 saplings and small bushes, including rare tree species such as Sorbus domestica (the service tree), wild pear and the beam-tree berry. Dr. Patrick Pyttel, Assistant Professor at the Chair of Silviculture at Freiburg University, advised SICK during the selection of these particularly ecologically valuable tree species, and was available to the participants during the planting campaign to answer any questions. A green space at the SICK Distribution Center in Waldkirch-Buchholz was selected for planting. The saplings and bushes will grow during the coming years and contribute towards offsetting CO2 emissions. At the end of the event, the children presented their plans for a positive climate reversal to parents and guests, and were made official ambassadors for climate justice. The Plant-for-the-Planet Initiative was started by the then nine-year-old Felix Finkbeiner in 2007. At the end of a presentation on the climate crisis, Felix outlined his vision of children in every country of the world planting a million trees in order to offset CO2 emissions. The aim of the youth initiative has meanwhile grown to planting 1,000 billion trees by 2020. Children and adults who advocate climate justice and an overall reduction of CO2 emissions have so far planted more than 15 billion trees in 193 countries. 70,000 children and youths from 67 countries have already been trained as ambassadors for climate justice at Academies worldwide. The Academies have become an official measure of the UN Decade of Training for Sustainable Development and been recommended by Germany’s Federal Ministry for the Environment (BMU). About 90 children took part in the Action Day for Climate Protection at SICK – Gisela Sick, widow of company founder Dr. Erwin Sick (second from right), and Reinhard Bösl, Executive Board member for Systems & Industries (right), were among the guests.